Diablo introduced the gaming world to the idea of the action role-playing game (ARPG), where the strongest warriors fight against evil with fantastic skills, and inventories become a type of mini-game where you can only take the best loot with you. Years later, Grinding Gear Games’ Path of Exile continues as a type of spiritual successor to Blizzard’s smash hit series. When Diablo III for PC finally arrived, those disappointed turned to Path of Exile to fill their ARPG needs. 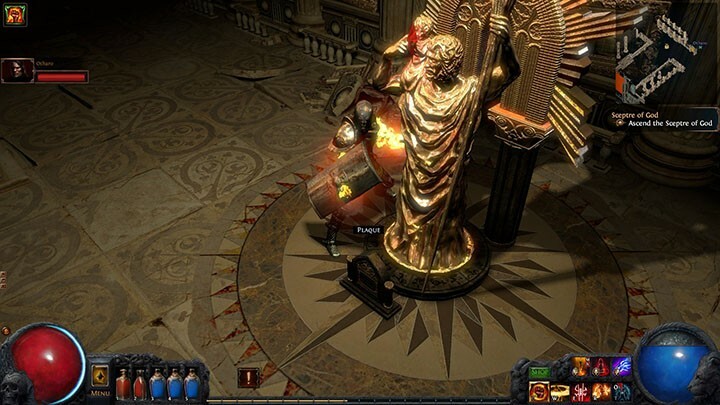 While carrying on many of the same traditions, Path of Exile has sought to differentiate itself through a massive skill tree, a wide variety of skills, and crafting that is mostly reliant on a finicky RNG (random number generator). Its latest expansion in The Awakening takes these already complex and rich gameplay systems and applies it to enjoyable new heights, with grandiose boss fights and a satisfying new story act. 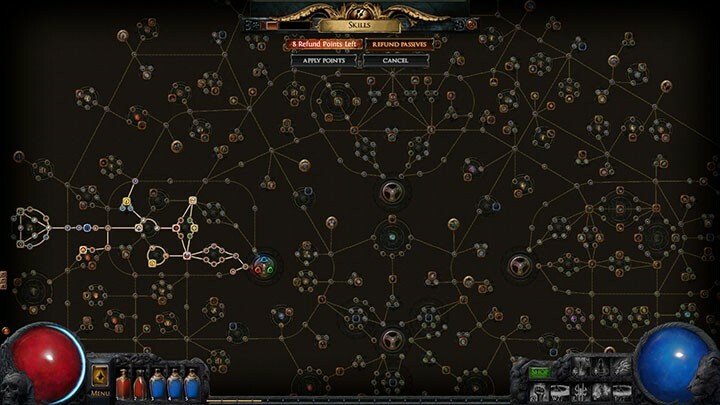 As mentioned earlier, the massive skill tree that stretches in all directions across the screen is a standout feature of Path of Exile. Each class gets the option of spreading out in two directions for viable builds except for the Scion class, which is unlocked at the end of Act 3 and has the ability to grow in all six directions. The Templar, my chosen class, relies on a balance of Strength and Intelligence as well as elemental and physical attacks using maces, kite shields, and elemental spells. Panning across this map reveals that the Templar can build towards paths that focus on physical attack and armor as well as high elemental damage, making the most of his abilities. A secondary Dexterity tree path is also available for alternate builds for the creative and experimental gamers. Finding the right way to combine skills is like a mini-game in itself. Another key feature of Path of Exile is the use of skill gems. These items grant active skills and spells by fitting into weapon and armor sockets. These active skills can be AoE or single target melee attacks/spells, buffs, and pet summons to name a few. Finding the right way to combine skills is like a mini-game in itself. The sockets in armor and weapons are color-coded for Strength (red), Dexterity (green), and Intelligence (blue). These sockets can also be linked so that support gems such as Added Lightning Damage can augment the active skill gems they are connected to. Getting the right color combination and link setup is as much a part of the loot hunt as getting better item stats. 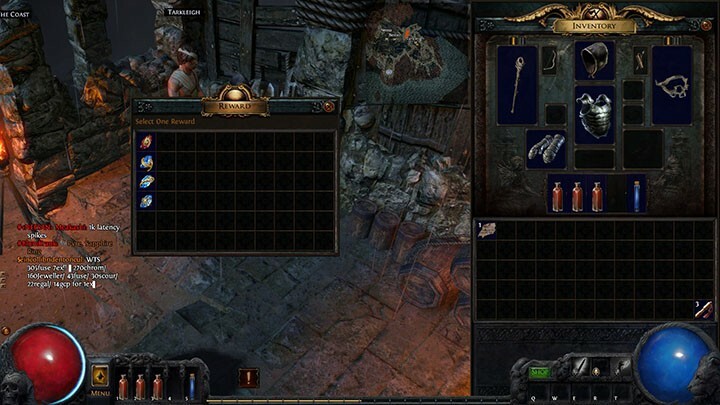 An interesting note about the game is that instead of a normal economy that uses currency like gold, Path of Exile uses a barter system based around various scrolls and orbs that are used to affect the equipment found out on the field. Identify scrolls explain themselves, but with other item names like “Alteration,” “Augmentation,” and “Transmutation,” I required the near constant use of tool tips to remember what they do. There’s also a complicated item hierarchy. For example, normal items grant scraps or whole identify scrolls, unidentified non-normals grant Transmutation shards, and identified non-normal items grant Alteration shards. Occasionally, selling many identified items at once grants other orbs and fragments, too. It’s a lot to keep track of. As for crafting, items are not created from recipes, but rather existing equipment is modded using the various orbs available. This means crafting is explicitly tied into the economy and even white items, as long as their base stats were good, were useful once modded. Unfortunately, this system also relies on RNG to enhance the modded items. A player’s stash of orbs can be quickly used up just trying to reforge equipment a few times. After adventuring through the vast hills and caves of Act 1, Path of Exile changes to areas that feature forests, ruins, and a cemetery in Act 2. It’s still a well made act concerning the graphics, music, and effects, but unfortunately it also has many repeat monsters from Act 1 (e.g. forest crabs?). In addition, some enemies are modified with extra armor, exploding arrows, or can run away when attacked. While these mods add variety to combat, they also tend to lengthen it and making it less appealing. One point of interest for the early part of the Act is a quest to kill three bandit leaders. The player can side with any one of these leaders and kill the other two for a reward such as more Hit Points, or a larger Mana pool. Should a teammate decide to aid a bandit lord, they are instantly flagged for PvP against the rest of the group. While some will appreciate the difficulty or excitement of fighting their own teammates, it can be quite annoying and time consuming if decisions are split among the group. One of the highlights of Act 2 is the NPC dialog, which starts out with the leader Gruest being thoroughly opposed to the presence of exiles in his village, while the other NPCs mock his harsh demeanor. The conflict between Greust and Silk is particularly funny. This changes about halfway through the act when the player winds up releasing a darkness that enshrouds the zone. The NPCs stop being cordial and, while they don’t outright attack, their dialog becomes accusatory as they send you on your way to fix everything. The dungeons feel more extensive in Act 2, with some repeated enemies and a few new Lovecraftian designs which hint at the true nature of the evil infecting the world. The act boss emphasizes this otherworldly origin, embodied as a three legged, tentacled construct. You’re also likely to start finding skill tree jewels, a new item introduced in The Awakening. These can be found in the usual red, green, and blue colors that match their enhancements to Strength, Dexterity, and Intelligence respectively. Later in the game, newfound jewels can be swapped out and can directly affect skill gems by adding multipliers and extending duration lengths. However, despite these new additions to the skill tree, the strong atmosphere, and the detailed dungeons, Act 2 feels too long and boring, offering stale combat and a storyline that feels too distantly linked to the player’s character. Act 3 is everything Act 2 fails to be. It follows an Egyptian theme with maps full of more difficult enemies, and also more rare and unique mobs. The environments are mostly regal looking with slightly overgrown hedge mazes and gilded halls devoted to the gods of the world — occupied by plenty of monsters of course. The story also pushes ahead to explain the recent past currently affecting your character rather than dwelling on the ancient mysteries. Topping it off, the hub town of Sarn is very large compared to those of previous acts, with more NPCs and areas to interact with, including the PvP-exclusive Arena. Act 3 is everything Act 2 fails to be. It’s around now that you can start accessing your Hideout, player housing introduced a year ago. It’s a great place to invite the Masters once you reach level 3 reputation with them. These Masters are a reputation-based set of NPCs which can be found throughout the world, like Elreon the Loremaster and Haku the Armormaster. Higher reputation with the Masters gives access to their personal stores, each with a specialized focus. Once the chosen Master(s) are inside your hideout, you can add their workbenches to your space, which can help eschew the RNG when adding bonuses to weapons, armor, jewelry, etc. Act 4, the newest act introduced in The Awakening expansion, is the true culmination of the game’s lore. Here the player can find themselves going toe to toe with legendary heroes and villains, finally putting an end to the stories of Dialla, Malachai, Kaom, and Daresso, to name a few. Divination Cards, another new feature of the expansion, start to drop here and can be turned in for rare items and orbs. This new gameplay system is used to both further the in-game economy and as another workaround for the RNG. Players still have to grind for these cards, but they can be turned in for guaranteed rewards. 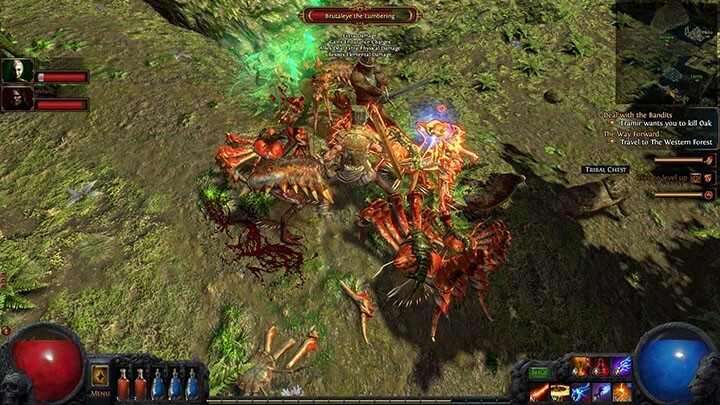 Survivability is key in this act as more unique enemies and sub bosses spawn in areas such as Daresso’s Dream and Kaom’s Dream. Many enemies have powerful AoE attacks that can kill at a lengthy range. The environments here are refined and feature themes with molten cliffs, marbled arenas, and even the grotesque innards of a demonic beast. Once you defeat the final boss, you’re rewarded with a portal to the Twilight Strand, the very first area of the game. Only now, the difficulty is increased to Cruel mode. This process can be repeated one more time to enter Merciless mode, then finally the endgame. Maps add a nice way to keep the experience fresh for a long time. 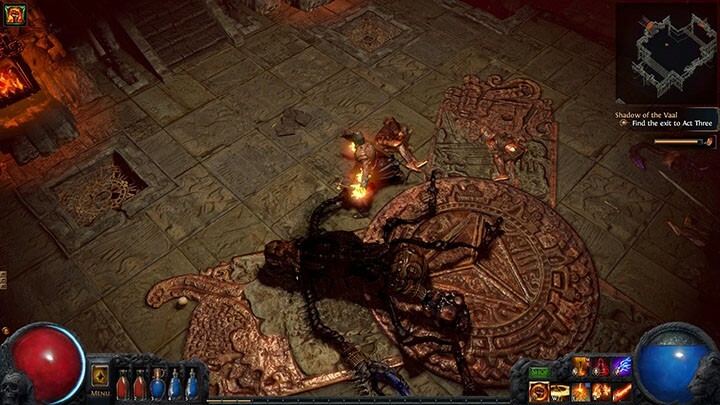 The endgame for Path of Exile takes the form of maps, areas that start at level 68 that are full of the hardest enemies in the game. Once you strengthen your character to the point of being able to tackle maps, the game gets even more fun. Just like equipment, maps can contain modifiers that change their contents. Monsters can do more damage, the ground can be covered with lava, and some abilities are locked out, to name a few. But along with these increased challenges comes even better rewards as maps consistently drop more and better quality items. Here’s where the real loot hunt begins, and maps add a nice way to keep the experience fresh for a long time. Overall, The Awakening is a successful expansion to Path of Exile. Act 4 is a welcome addition to the story, providing more closure than the end of Act 3, and introducing complex and challenging combat that can make even the most stalwart player rethink their skill tree options. It’s thrilling to go head to head with some of the classic heroes and villains mentioned and plants the player firmly within the lore of the game. New features like jewels and divination cards help to make the experience even more robust. 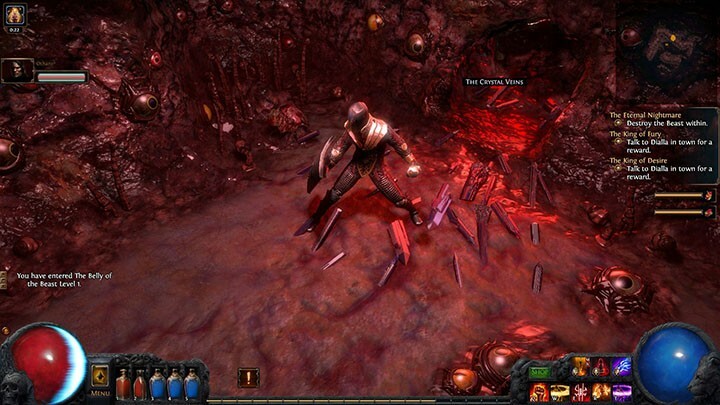 Although Path of Exile can become grindy at times, it still delivers great customization and interesting environments. One only has left to wonder: what’s beyond the mountain once the Beast has been defeated?